Who knows, you may be the one to say, "I named that puzzle". Excerpt from: Marketingprofs.com by: Community Member "The issue of Honesty, integrity and trustworthiness are time tested values known to man. They are probably more important now than ever, with the power of the internet to share information and do business". 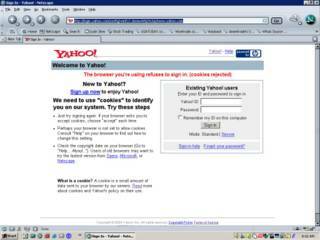 The following was an exercise in online discovery and looking at the search results in various search engines. Then comparing those search results against the actual pages displayed in the result and asking a simple question as a thesis. If the majority of the search results, within any one search result, display web page results from a select group of websites or websites owned by someone else, then whose page is really being displayed? Compare the search results below, and notice the patterns. All links should open in a new window, but the same new window. Note: Over time I suspect the search result patterns will drastically change. We will have to analyze it every so often and see what changes occur over time. How about Search Results of search results with-in search results? If you get to this point and opened all the links and still asking yourself, - - What is he talking about? - -, then you really have not paid attention to the results. Look at it again from the top down if you still do not understand. ***Note: All of us involved in website work probably have made mistakes... Heck probably by placing all these URLs in this blog is a mistake... I don't know... We do need some specific guidelines as to how much is too much. In the process of trying to show a pattern of something, I probably made another pattern... I will point out that I chose to place the references first in this blog. 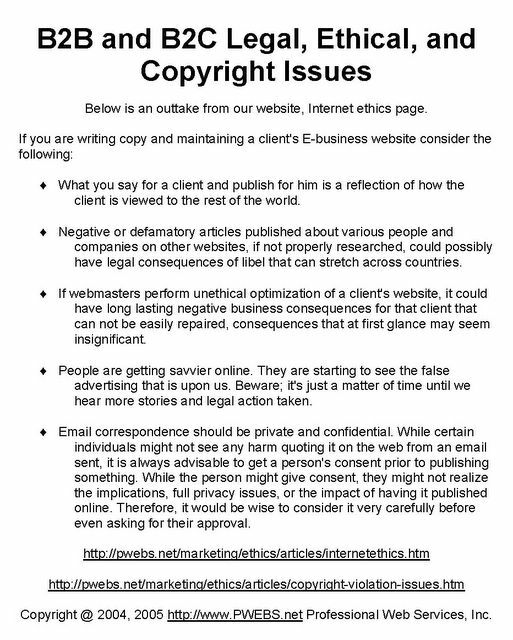 Most sites are not placing any references at all and thus are in a number of instances guilty of plagiarism or copyright infringement, not to mention crossing over boundaries in other legal, regulatory, and ethical areas for publishing, marketing, advertising, sales, and general business practices. I believe there needs to be very specific detailed guidelines for Internet marketing guidance regarding links. To say someone has too many contextual website links is talking in generalities and does not provide a framework for improving the Internet structure. The Internet is supposed to be about links. If the website links are related to the subject information or provide additional information for the reader then that is good. This also provides a means of giving credit to your references. Consider also: A large number of search engines are doing exactly what some in the SEO community are saying about contextual links. 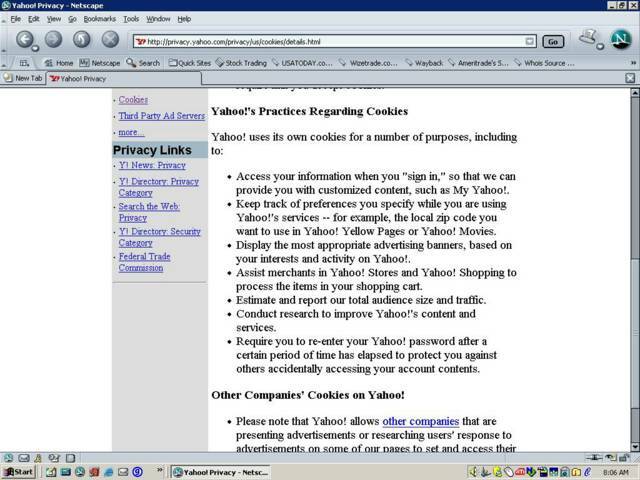 This is being done by various search engines in the form of saved results being fed back into another search company. Each and every one of the saved results is a contextual link and thus is doing exactly what some are claiming being done by individuals. In that case the whole page is made up of nothing but links. An interesting side bar note: One Search company even places old pages from others that have been long gone into their results. Sometimes it is the old sometimes the new. My impression is they are using it only for getting a higher ranking in the competitor's engine. In addition, with the saved results, it results in a large number of copyright, legal, ethical, and regulatory issues which in fact cross global geographic bounds. In fact, some unethical companies are using the SERPs (Search Engine Results Page) and pasting it into their own pages for the sole purpose of improving their rankings. This is like plagiarizing an article. If some companies are doing it, then others feel that it is OK to do. At what point do you stop? So, the bottom line is, if you have an idea for how much is too much, then share it. Contact us for your Internet Marketing needs; Professional Web Services, Inc., the ethical technical online marketing professionals. Global Internet B2B Marketing + "B2C"
B2C online vs B2B online marketing. Global marketing on a B2C site. B2B Internet marketing and B2C advertising differences. What is the difference in marketing? Any business that sells mainly to other businesses is considered business-to-business or B2B for short. Other countries sometimes use B to B for short. Any business that sells directly to consumers, for the most part is considered business-to-consumer, B2C, or B to C for short. Companies can be both B2B and B2C at the same time. Target markets for each of these areas are handled differently. B2B generally takes more on the front end to make a sale, although places like office supply outlets create B2B accounts for their business customers, and businesses will generally keep coming back to a self serve eCommerce website to place additional orders without ever talking with a salesman. No matter which company you are classified under, or the differences between B2B or B2C for closing a sale, the emphasis for marketing and advertising online is to get your message in front of the buyer or consumer. That generally means using the search engines to the best capabilities in both an Internet marketing emphasis and an online keyword advertising targeted campaign to maximize the power of the Internet. Contact Professional Web Services today for an overview of how to market and advertise your business online. What are the differences between B2B, B2C, and C2C? 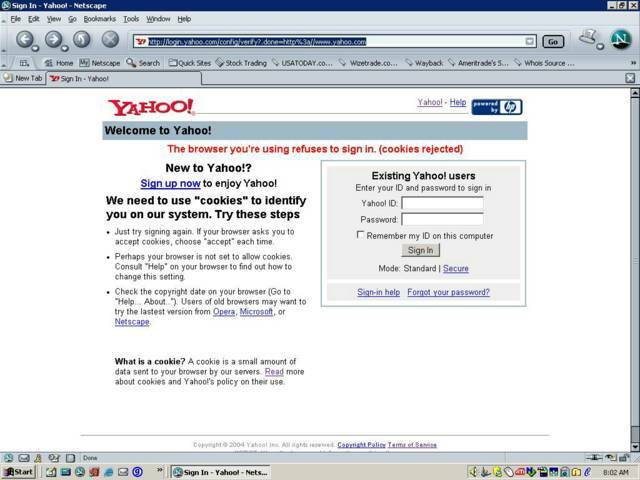 And Still Another Yahoo!® Screen! Now it was getting a little ridiculous. After receiving a number of other screens, this one popped up. This one had special words to input for login. A interesting thing occured when I went to login. I got a strange message on the screen. 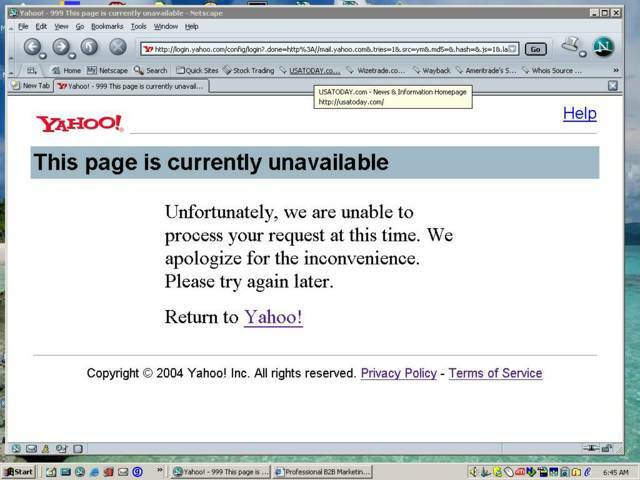 This was the first time I had ever received this message from this provider about a page currently unavailable. "technical professional" and "success strategies"
Is the search result factual? Or maybe, the search company is intentionally not displaying the Title and Discription in the SERP (search engine results page). 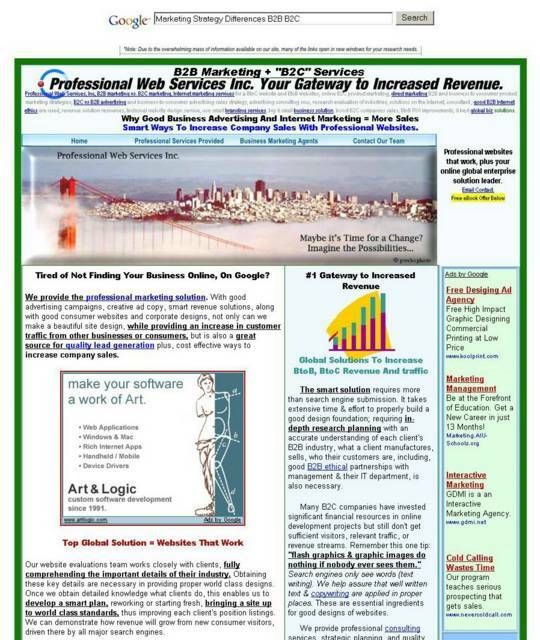 Title = "Professional B2B Marketing + "B2C" Services Successful Strategies Business Websites and Technical Solutions"
Description content = "Good Internet Marketing Business Services Advertising Strategies Services, strategies, and solutions to the internet marketing advertising puzzle, resulting in increased sales for you. The Leader In Marketing, Business To Business Marketing Services." Tell It Like It Is and Do it With Style!!! When dealing with ethics in a B2B company and B2C clients there is a major degree of trust and responsibility that is imparted to a person or group that maintains the company Web site. It is very important from both an ethical values based business and legal B2B and B2C perspective to make sure that the written words and what is portrayed about a company are factual. 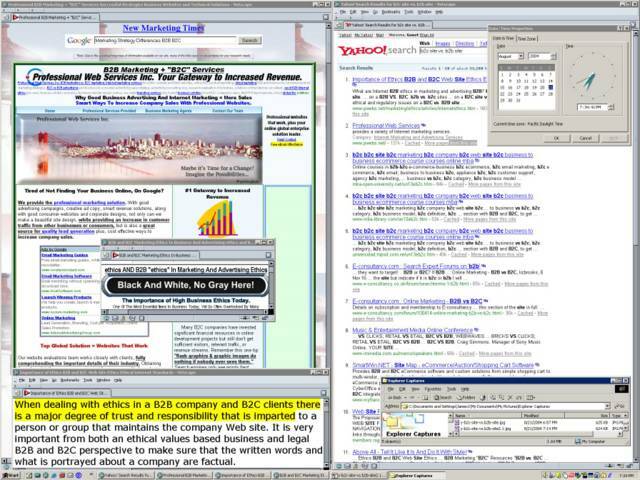 © 2004, 2005 Professional Web Services, Inc.
Time For a Pit Stop… on Redirects! I am not sure where to begin on this one.. Here is an egregious case of unethical behavior. Note, I am not sure how long this situation will exist? Instructions: Click on the following India searches, then compare to the USA search results. 1-Hint: Besides looking at the results, Look closely at the bottom of your browser when on any of the URL Search Results. Look at the .rd or the .rds in the URL's prior to and also during the movement from the search results to the page. Now do the following USA searches. Compare the differences. 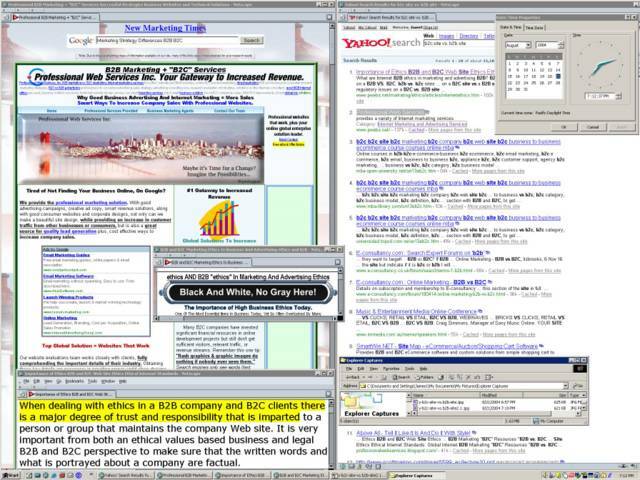 "B2B AND B2C" "internet marketing differences"
Take a look closely at other results also.. Title = "Technical Internet Marketing Services Strategies Professional Solutions"
Description content = "Professional Internet marketing business services, online advertising strategies, successful marketing solutions to the Internet marketing & advertising puzzle, resulting in increased sales for you. 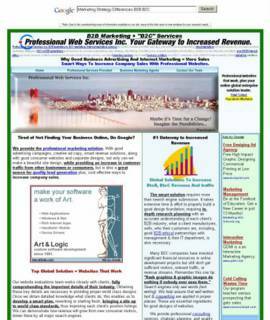 Professional Web Services, Inc."
Why the redirects? Maybe search results are stored by some search engines and then feed back into the (SERP) of other search engines.. Why are the titles and descriptions in some SERP different for other SERP with-in the same search engine? Who makes the decision of which title shows when and where? Does the title and description affect the results? With such a system how can there ever be ethical fairness? Does it matter to you? Maybe you don't think it affects you... How can you be sure? How many of you out there want to voice your frustration about being interrupted in the middle of dinner by those nagging automated computer calls? After putting in a long day of work I come home and just want to relax. Instead, I receive this automated dialer phone call with a long lag, at which a marketing person comes online and tries to sell you something that you don’t want to even hear about. I have installed a little device that is supposed to stop most of these by sending a little ping or some sort of signal when the phone is picked up. This then signals the data base that your number is not a good number and the connection does not go through. After several months of using it my wife and I have both come to the conclusion that it helps. What it doesn’t help against is, the pushy sales people that call at various times. How many of you out there have too many email addresses and not enough time to continually log in to each one? Well, if your like me I have numerous ones that I need to be in touch with on a regular basis. I don't have time to check them individually. For the past year or so I have been using ePrompter, a program that monitors them for me. It sits in the lower right hand corner of my tool bar and displays a different colored circle with a number in it. Each color represents a different mail box. When an email arrives at one of the mail boxes the number count is updated and a little ping goes off to let you know you have mail. The neat thing about this one is that it does not display full graphic images, but it does display url links. This makes it very easy to preview the email. If you want to view all the graphics later then you can use your main program to do it. I use this in conjunction with Mozilla for my email organization. * Unique Rotating Tray Icon shows # of new messages in each account. * Choice of five screensavers that show # of new messages per account. * Autodial goes online and retrieves messages at scheduled intervals. * Choice of two audio alerts for new messages. 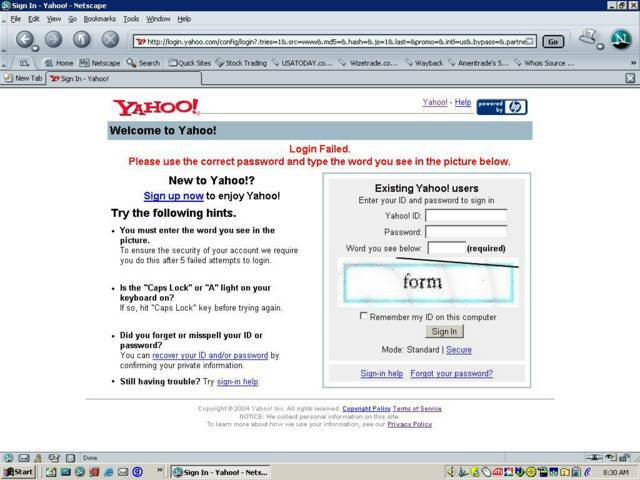 * Optional password protection for individual accounts. * Message headers or full messages available online or offline. * Delete messages while online or in autodial mode. * Separate retrieval intervals for online and autodial modes. * The ability to print messages. * The ability to read hyperlinks. * The ability to work with standard firewalls and proxy servers. * The ability to retain retrieved messages when a computer is turned off. * Lean installation - Minimal computer requirements. * Easy download, setup and uninstall. * Microsoft Windows 95, 98, ME, XP, NT, or 2000. 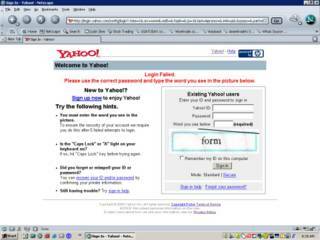 * AOL autodial requires AOL 5.0, 6.0, 7.0, 8.0 or 9.0. 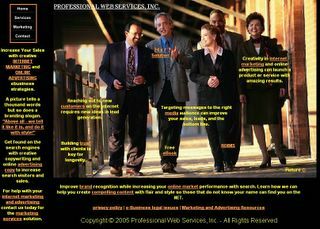 Copyright © 2004, 2005 Professional Web Services, Inc. All rights reserved. What is your favorite Email prompter tool and why? Here is another area of Business Marketing and Advertising Ethics that really tics me off! I am sure there are robots that continually cruise the net and log in phone and fax numbers and then these businesses turn around and sell the lists to people that try to market there product directly to you. At the bottom of the fax is a number to call to be removed from the database. My gut feeling is at times that if you respond to this number that just confirms the number to the database. These laws are not working. 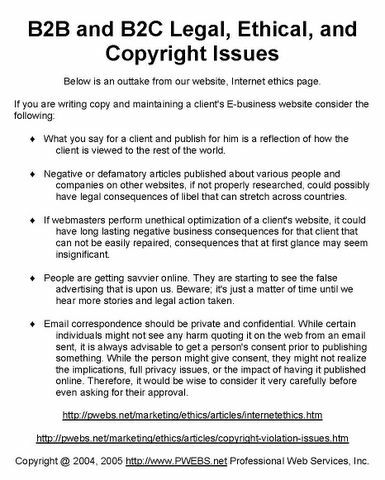 Visit our Ethics in Business page and from there go to the Internet Ethics page for reference material and links to specific legal authorities for this and other types of behavior. We are pleased to inform you of the result of the Lottery Winners International programs held on the 13th August 2004. Your e-mail address attached to ticket number 278541465006-4872 with serial Number 1772-554 drew lucky numbers 5-14-18-23-33-39 which consequently won in the 1st category, you have therefore been approved for a lump sum pay out of €1,000,000 (One Million Euros) CONGRATULATIONS!!! Due to some numbers and names, we ask that you keep your winning information confidential until you file for your claim. This is part of our security protocol to avoid double claiming and unwarranted abuse of this program by some participants. All participants were selected through a computer ballot system drawn from over 20,000 companies and 30,000,000 individual e-mail addresses and names from all over the World. This promotional program takes place every year. This lottery was promoted and sponsored by some eminent personalities who do not Wish to declare their identity for security reasons. Remember, all winning must be filed not later than 26th August 2004 or when authentic proof is given for the delay of filing. Please note in order to avoid unnecessary delays and complications, remember to quote your reference number and batch numbers in all correspondence. Furthermore, should there be any change of address do inform our agent as soon as possible. Congratulations once more from our members of staff and thank you for being a Winner in our promotional program. Note: Anybody under the age of 18 years is automatically disqualified. Note: Removed names in case there really are live people with those names but not related to the problem. How many of you have received this type of eMail? Internet B2B Marketing "B2C" Marketing Tool. If you are only using Internet Explorer as the main browser for doing research or just browsing the web, then you are really missing the boat. Check out my favorite for market research as well as cruising on the web. Mozilla is free, works with all systems and is a great tool to handle multiple Email accounts and keep them separate while not having to jump around with different log on names as you do in Outlook®. But that is not its only strength... The best part about it is, it allows you to open up multi-tabs with-in the same window to other links by simply right clicking on the mouse and open in new tab. 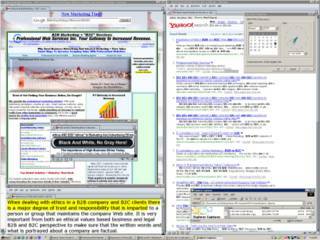 Tabs can be bookmarked as a group of favorites and then with a click of a mouse they can all be opened in one window at the same time. This is great if you have several websites that are visited each day. The beauty of this software is: for research purposes, one can very easily navigate and cross reference items. Use it to compare several different items and pages at the same time. Mozilla and the new Firefox are supported by a large community of programmers. For the http://www.apple.com/ community Safari is the program for you. I have had a little opportunity to evaluate this one. 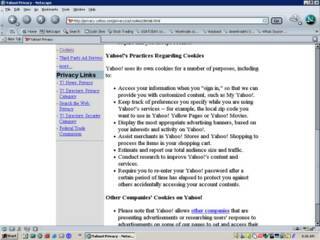 It is a very impressive program and has a lot of the same features that the Mozilla browser can do. Share your hints and tips on your favorite browser. What is the 24 / 7 business solution for B2B and B2C? If you arrived from our website, use only the back button in your browser to view the Golden Treasure. Above All - We Tell It Like It Is And Do It With Style! This blog is for the marketing community to freely use it for the purpose of sharing thoughts, ideas, tips, and strategies for helping businesses grow and prosper using Internet tools for marketing. Please visit our website at http://www.pwebs.net for an overview, with extensive resources to discover and mine, the treasures online. Search for Gold. Use the comments section to share your tips, helpful suggestions, or questions to the online community. One word of caution - Only ethical ideas and tips. For some starter ideas visit our home page for a free eBook offer by a well know author. The author provides: Strategy Tips, Secrets, Tools, Opportunities, & Practical Advice. Contact us: Internet marketing, online advertising, services, strategies, and solutions. 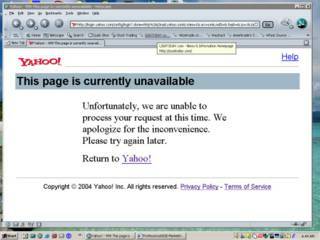 Copyright © 2004, 2005 Professional Web Services, Inc., All rights reserved.